Unstretched and unframed. Formerly stapled onto 92.97.117. 1 painting : image 31 x 39.25 in., unstretched canvas 33.5 x 41.25 in. Children learning katakana, Japanese phonetic alphabet, at a California Japanese language school. 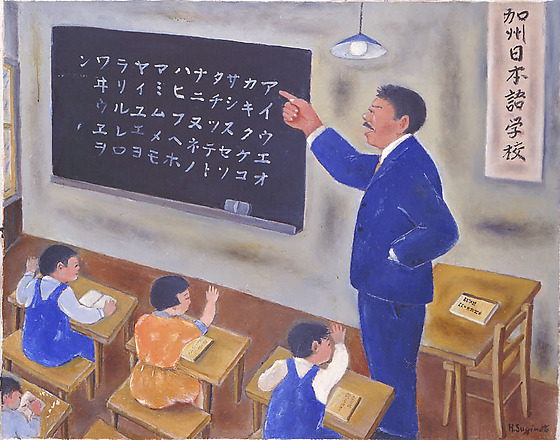 A mustached man in a blue suit stands at right before three children seated at desks pointing to a chalkboard with katakana. He faces left in profile to the viewer with his left hand in pocket and other raised to the black chalkboard at left. Behind him, a chair and desk with a Japanese language book, "Kashu konin, Kashu Nihongo Gakko hon," stands against a grey wall under a sign with Japanese writing, "Kashu Nihongo Gakko" (California Japanese Language School). A single bulb blue lamp hangs overhead. Two boys in overalls and one girl in an orange dress sit in the front row with their backs to the viewer, raising their hands. A boy sits in the second row in the lower left corner writing in his book. Part of a window is visible on the left.